I love snow, and the way it covers over everything-good and bad alike!� It’s snowing outside right now, and we’re supposed get another four inches on top of the six we have on the ground.� There is nothing more beautiful, in nature, than new fallen snow covering the landscape, turning it into a white wonderland.� A pile of junk, in your back yard, can be transformed into a glorious “snow sculpture” by 6 inches of white fluff! There is a scripture that says “Though your sins be as scarlet, they shall be white as snow!”� It’s comforting to know that God can cover the “junk” in our backyards, and transform that “heep” into something beautiful.� Let it snow! “Hurry up dad this thing is heavy!” It would seem that my son could possibly be saying those words. He is straining just a “tad.” Hope everyone got their turkey permits turned in on time. Season opener will be upon us sooner than you think. 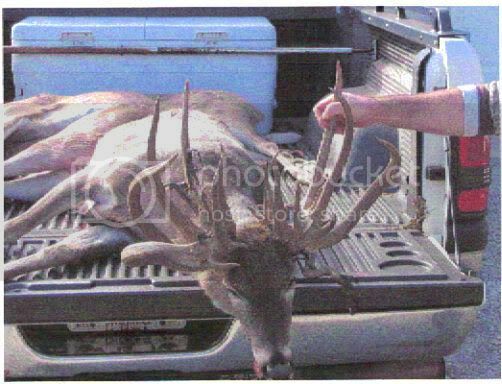 I put in for the second hunt this year for the northern lower peninsula. It’s been years since I hunted my old stomping grounds of Mio, Lewiston, and Fairview. I have some sweet memories of all those area’s, and I guess it’s nostalgia that’s drawing me back. There’s one spot in particular I want to try, but I haven’t been there in 20 years. I probably won’t even recognize it! I know part of it was timbered off, and I was told it looked like the surface of the moon when the loggers were done. It should be grown up by now, but will the turkey’s still be there? Do your home work guys. I plan on scouting at least twice before I decide where I’ll hunt. I picked the second season, because of all the snow we’ve had this year. I’m betting on a late spring, but it wouldn’t be the first time I was wrong on that kind of thinking. When scouting, I like to make use of my crow call, along with my owl, and peacock calls. They are “locater” calls and work best in the morning and late evening. Of course I’ll be looking for a roost, and when I find one, will steer clear of that area until opening day. 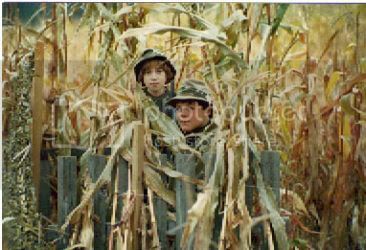 Make sure you are well concealed, and if your hunting from a pop-up ground blind, get it set up several days before you hunt. Turkeys aren’t as spooky as deer when it comes to changing their living room furniture, but hunters need every advantage they can get. There’s no sense in making a wary bird even more wary by placing a “new” bush on his favorite path. The last thing we all need to remember is shoot for the head (pattern your gun) and neck area once he presents you with a good shot. I can’t wait! This is a blog I have been thinking about doing for some time now, but for reason’s you’ll soon understand, I’ve been apprehensive!� The outfit I’m wearing belonged to a friend of mine, who graciously loaned it to me for one of our “wild game dinners.”� The necklace was made from various bones, antlers, and feathers from game taken by my friend.� The same with the outfit-all hand made from deer, bear, and raccoon!� I don’t want to mention his name, as it could cause pain where none is intended.� You see my friend (and co-worker) took his own life several years ago, shocking his family, and all who knew him. My friend was an extremely funny guy, and the greatest practical joker in the plant.� He didn’t seem to let the “bumps” in the road get to him, but that is where “we” his friends were wrong.� In retrospect it seems some of his closer buddies should of noticed� the signs of a hurting soul. This man was a “hunters” hunter!� He played by the rules, and never took the easy way, in pursuing his quarry.� He was a very successful hunter, and a first class archer.� He won many of� the various archery tournaments he participated in, and had the “fire” of a true competitor in his eyes!� He had alot going for him; good job, great sons, handsome, well liked, but something was obviously missing.� I guess I need to say my friend had been married and divorced three times.� This was probably the “closet” in which his demon hid! I am 100% sure that if he could, he would be hunting with his sons today.� He had much to live for.� His family and children must miss him terribly!� What a tragedy and waste of such a talented human being. Now here is the main reason I’ve told you this story.� If anyone reading this is depressed and feels like he can’t cope with life, and that no one understands, please talk to someone!� Seek out a pastor, priest, close friend, sibling, but do not “go it alone!”� You need someone to “cover your backside!”� I once heard a sermon where the pastor explained when Roman soldiers went into battle, they always fought in pairs.� As a warrior you could only take care of what was “in front of you!”� You couldn’t see the enemy who might sneak up behind you, thus your partner “covered your backside,” and you of course covered his.� By all means get help, and if anyone suspects something is amiss in a friends life “speak up!”� Better to rock the boat a little bit than to have a good pal go overboard. Happy Birthday son! This is my son Micah and his sister Courtney. Tomorrow is Micah’s birthday, and he will be 25 years old. Where does the time go? You can’t see it in the picture, but Micah has a black eye. He didn’t get it from his sister, but from a plastic hammer that bounced off a peg he was pounding on! What fun we had when our six kids were little. I wouldn’t trade those days for anything. Micah was my little buddy from the get go. 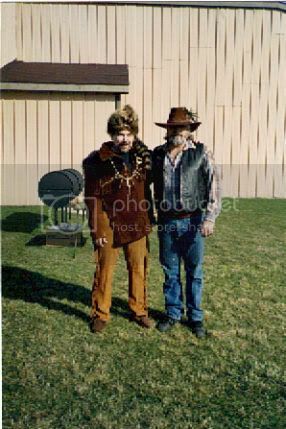 He was my hunting partner, and even my camera-man, by the time he was in 2nd. grade. At nine years old he was filming me miss a beautiful Quebec black bear. Not only did he capture me on film making one bad shot, but kept the camera rolling as I missed again at eight yards! Can you imagine? Of course I want to do this right, and impress my son with my archery skills, but how in the world do you miss a 300 pound black bear at eight yards? Well here is the secret-You close the wrong eye when lining up your sights! After the second miss Micah looks at me and says “Dad you should of let me shoot!” You talk about humiliating! I rattled in Micah’s first buck when he was 16 years old, and saw the whole scenario as he placed an almost perfect shot with his bow. 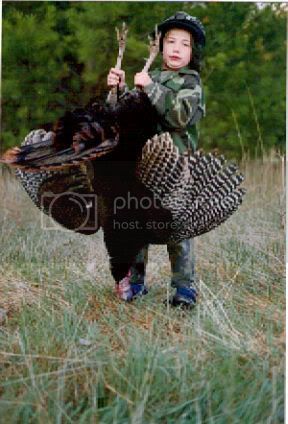 I was there when he took his first turkey. We’ve fished for brook trout in some of the wildest country in the Upper Peninsula, took huge northers from an unnamed lake in Canada, and prayed that God would protect us, as a fierce storm threatened to swamp our boat. We tracked down a gut shot doe, (it happens) and found it for Micah’s first archery deer. Four-wheeling, camping, and cheap motels. We’ve been there and done that. He was not only my son and little hunting pal, but we genuinely enjoyed one another. He could make me laugh, and always carried his share of duties around camp. The time he set up his own “bear bait pile” is a whole story in itself. In fact I did a blog about it many months ago. Micah is on the small side. He’s about 5ft. 4 inches tall, and wrestled in high school at between 103 and 119. He still has the “take down” record at school, and once recorded a pin in 12 seconds. He was co-captain of the junior varsity soccer team, and played varsity baseball. After high school Micah signed up for a Christian program called 24/7 located in Colorado Springs. This missionary program taught leadership skills to young men and women, and deployed them around the world. Micah has been to Mexico, South American, and Nigeria. When he was in Africa Muslim’s were waging gorilla warfare. Him and one of his friends had an encounter with machine gun toting rebals during one of there jungle projects, and Micah ended up wearing their ammo belts while holding the assault rifle. He thought the picture was “cool!” If we would of only known! I guess it’s best we didn’t know everything that was going on during these time abroad. Micah has eaten stuff that would qualify for “fear factor!” He’s ran to the top of Pike’s Peak, rappelled steep cliffs, and participated in several iron man events. He slept under the stars in 15 below weather, and climbed the summit of South America’s tallest mountains. Micah has been home for several years now, and is about to finish up on his associates degree. He has such a heart for those marginalized by society, and earnestly desires to do Gods will with his life. I know he can make a difference in this world, and I am honored to call him son. May the blessing of knowing God’s voice, and following His will forever guide your life. I love you son-Happy Birthday. 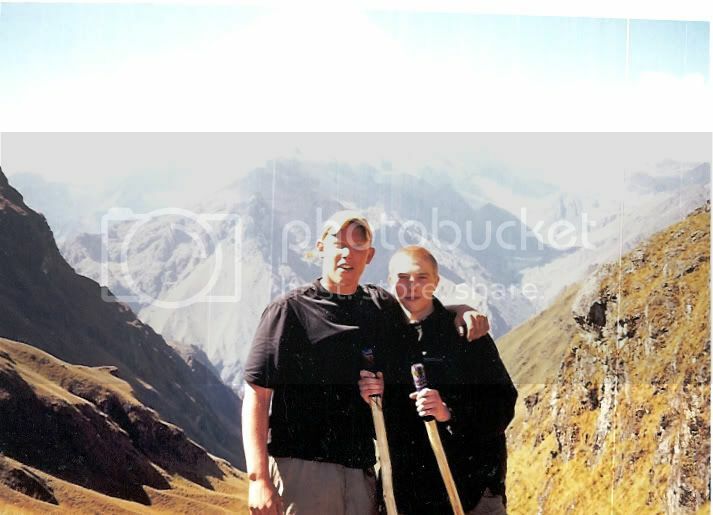 Micah (on right) and Ben in Peru hiking toward the ancient Aztec ruins. 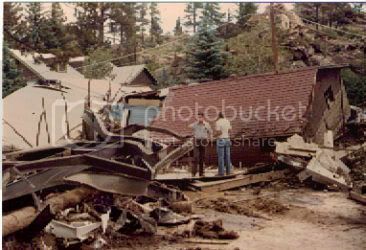 Looking at this mess one would think a tornado ripped through this area, but this is in the mountains of Estes Park Colorado! What could be behind all this damage? Recently Monroe has been under a flood watch/warning, and has in fact experienced substantial flooding through the East side neighborhoods of town. The combination of rain, snow, melting ice, and extreme temperature fluctuations created the conditions needed for our winter “waterland” emergency. Now travel back with me to Estes Park during the mid 1980’s. We were camping about 8 miles from this beautiful little “tourist” town,and had just woke up to sunshine and blue sky’s. Gary, our offical camp cook, was well on the way of having breakfast ready for nine hungry campers. He had the radio on listening to the local news, when the announcer broke in with a frantic warning! He was calling for the evacuation of downtown Estes Park due to floodwaters racing toward town! At first we thought it was a joke, as the weather was gorgeous, and there wasn’t a cloud in the sky. As we all gathered around the radio, we soon found out that an earthen dam had collapsed. Located high up in the rockies, the small lake this dam was holding back, was now coming down a little stream that ran right through downtown Estes Park! We hopped in our cars and raced toward town to see if we could possibly be of any help. We arrived there about 20 minutes after the “little 6-foot wide stream” cut its deadly path through town! We couldn’t believe our eyes, at the damage that was done, to the quaint shops and stores down main street. A trailer park took a direct hit, and several motels were wiped out, along with the first few stores and restaurants, where the water entered town! Emergency crews were already hard at work trying to move the tons of mud that blocked every roadway, and flowed through many of the stores. Roadblocks were being set up, so we got out and walked around on foot surveying the damage. This very nice looking barn is what’s known among my brothers as “Randy’s doghouse!” Randy’s youngest son Josh is a builder, and he helped put this barn up in Randy’s back yard. 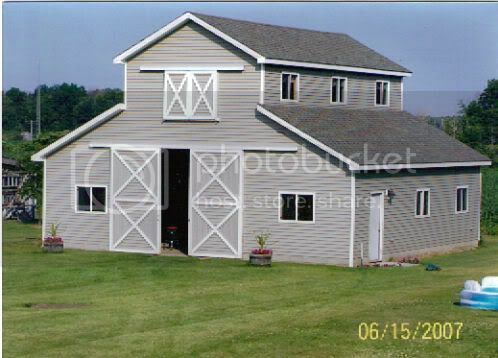 This is an every mans dream barn, or I mean doghouse. Much prior planning went into this unique structure believe me. Down below is a work shop, storage area, and parking for 4-wheelers, tractors, lawnmowers, ect. Plenty of counter space, drawers, and storage bins for the various projects we outdoors people find ourselves involved with. 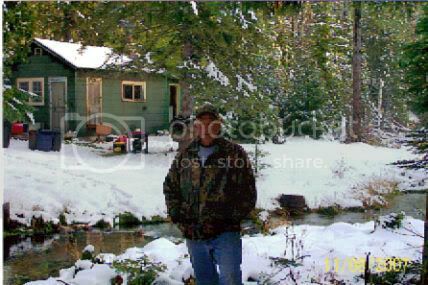 This is my oldest brother Randy, and his deer hunting camp in the Upper Peninsula. Randy is 63 years old, but you’d never know it! He refuses to roll over for “Father Time” and act his age. His little camp sits on 40 acres, and is surrounded by state land. It is in the “boonies,” and that’s just the way he likes it. He has leased this backwoods jewel for 6 or 7 years now, and loves to spend bow and gun season “working” around his paradise! 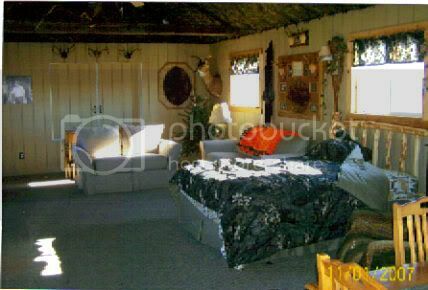 The one room cabin dates back to the 1920’s, and was owned by a doctor at one time. Randy has made the interior, of this little� camp,quite comfortable, but four (4) guys is pushing things to the limit during hunting season. Usually one, or all, of Randy’s three sons spend, at least part of, deer season in camp with him, but Randy has been known to stay there days on end by himself! Randy is a typical “first born.” He’s a leader, a go getter, a man with vision! He served two tours of duty in Viet Nam, excelled in the insurance business, and is a successful entrepreneur. There is a certain “allure” about “roughing” it that’s right up Randy’s alley. He loves to listen to the sound of the small waterfalls, next to his camp, as he drifts of to sleep each night. Randy and his son Justin trapped that little creek a few winters ago, and took several beavers. Two of them went over 50 pounds! Justin tanned the hides, and gave them out as Christmas gifts that winter. 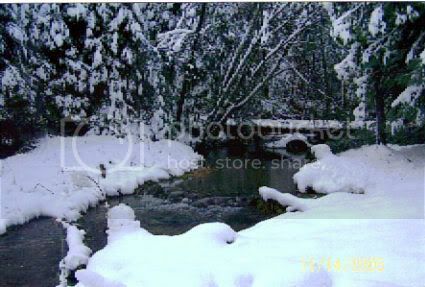 They eat fresh brook trout from the stream, and partridge and squirrel during season. 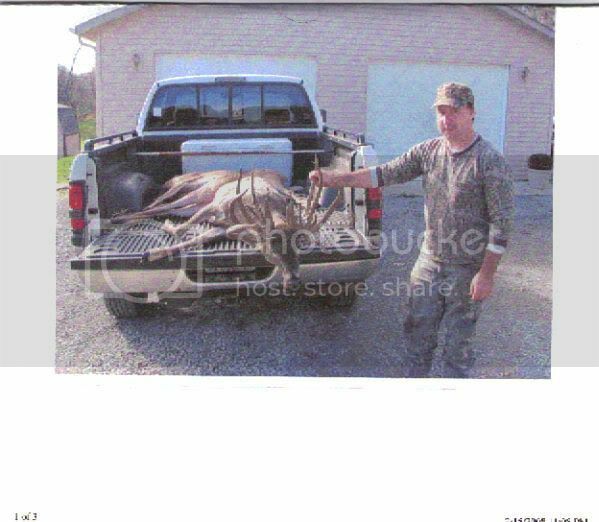 Bears have come in the front yard, and a few years ago brother Brad filled his bear permit on Randy’s forty. The deer numbers aren’t that fantastic in the area, but Randy’s crew always manages to put a couple deer on the game pole. Randy’s a survivor, a true outdoorsmen, and a man that takes life by the horns and won’t let go. Glad he’s my big brother! The goose hunters! This is my brothers Randy and Darryl showing off the success of a mornings hunt. 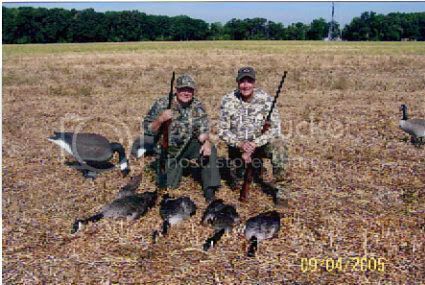 These were taken during the late goose season not far from Darryl’s house. 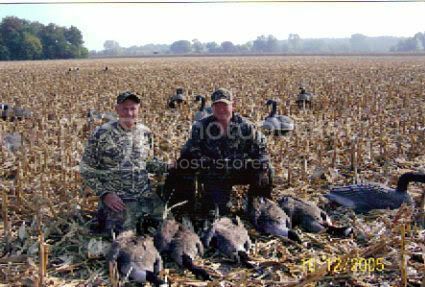 They also hunt the cut corn right next door to where Randy lives, and did very well there this year. I’ve had some “smoked” goose, and it was quite tasty. This picture was from earlier in the year, and you can see the geese are much smaller. The giant Canadians are what your after come the late season. These pictures are from two seasons ago, as my brothers don’t have this years pictures developed yet. They had an excellent late season this year, and put alot of goose-breast in the freezer. Darryl is an excellent caller, and the Cabela’s duck/goose blinds really help. We’re a Remington model 870 family, and we do just fine with them. Can’t wait to try Darryl’s next batch of smoked goose breast! Is “Gun Control” The Answer? I’m not quite sure how to even start this blog. 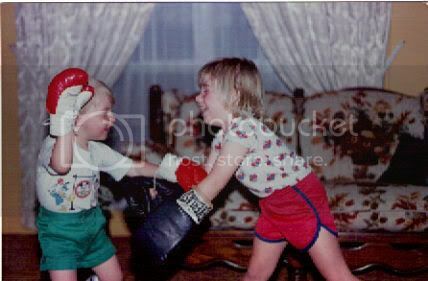 In this picture is my third daughter Meghan (I have five,) and my nephew Derek. I posted this picture because I felt it best depicted the Ansel family hunting heritage. I have five brothers, and we have nineteen kids between us. Those nineteen have twenty seven (27) children, and still counting, between them. With son-in-laws, and daughter-in-laws thrown in, not to forget my mom there are seventy three (73) of us gun-toten citizens in our family. Collectively we own over 100 rifles, shotguns, muzzleloaders, and pistols! All of our sons, and several grandsons, have taken the “hunter safety course” required by the state of Michigan in order to obtain a hunting license. Several of the women in the family have also taken this course. Three of my brothers are policemen, so firearms have always been part of what this family is all about. I took the hunter safety course myself when I was a boy scout, and I think it should be a mandatory class, taught somewhere along the line, while are kids are in junior high. The focus is on hunter/gun safety and the “PROPER” use of firearms. I guess where I’m going with this is the fact that over the last sixty three (63) years we have not had one (1) incident concerning the improper use of a firearm. I honestly don’t think we owe that statistic to “luck!” The six Ansel brothers, our children, grandchildren, and friends of the family have been taught the proper respect due these weapons that can be used for “good or “evil!” Proper firearms training is important, but we Ansel’s have had some excellent training from our mother also. She always taught us to be sensitive to the needs of others, and to never be selfish. “Do unto others as you would have them do unto you,” was the way she brought us up. To this day my mother would give you her last dollar if you had need of it. She inherited this most generous and wonderful attribute from her father Kelly Greer, my Canadian grandfather. I guess the point I’m trying to make is proper training, along with proper morals, leads to proper living. The carnage of taking innocents lives does not compute in my brain! In one violent selfish act the potential to make a difference in this” troubled” world is gone, and many lives are shattered forever. You can outlaw guns, knives, ball bats, rocks, crowbars, beer bottles, and a hundred other “weapons,” but until you get to the evil, behind the act, it will continue! When are we going to learn to be our “brothers keeper” and respect one another as a precious gift? Continue to uphold in prayer the families of this latest incident of evil, random, violence. First of all I want to thank all of you who were praying for me, and keeping me in your thoughts yesterday. The heart catheter went off without a hitch, and everything inside the “pump house” seems to be in good working order. Now all I have to do is loose about 35 pounds and I’ll be all set for an Alaskan hunt!